Active noise reductionCancels out interior noise by playing the opposite noise through the vehicle's speakers. Cancels out interior noise by playing the opposite noise through the vehicle's speakers. Dual power sliding doorsBoth sliding doors can be opened and closed using buttons inside the vehicle and on the keyfob. Both sliding doors can be opened and closed using buttons inside the vehicle and on the keyfob. Hands-free sliding doorsOpen a sliding door by waving a foot beneath the rocker or a hand near a sensor. Open a sliding door by waving a foot beneath the rocker or a hand near a sensor. 4G LTE connectivityHigher speed Internet connection. Monthly fee after trial period. Higher speed Internet connection. Monthly fee after trial period. HDMI portEnables input of HD video. Enables input of HD video. Streaming video supportCan connect a phone plus either a Chromecast, Apple TV, Roku, or other device to the in-car Wi-Fi network and use apps to stream video onto rear screen and/or onto the front screen if the car is in park. 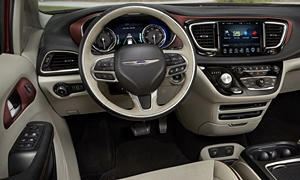 Can connect a phone plus either a Chromecast, Apple TV, Roku, or other device to the in-car Wi-Fi network and use apps to stream video onto rear screen and/or onto the front screen if the car is in park. Touchscreen rear entertainment displaysThe displays for the entertainment system can function as touchscreens. The displays for the entertainment system can function as touchscreens. Wi-Fi hotspotProvides Wi-Fi within the car. Includes internal modem, usually requires car-specific broadband service with monthly fee. Provides Wi-Fi within the car. Includes internal modem, usually requires car-specific broadband service with monthly fee. 6.6 kW onboard chargerDouble level charger, faster charge times with 220V source. Double level charger, faster charge times with 220V source. Power-stowing third row seatsSeat powers into a well completely beneath the floor level to enlarge cargo area. Also powers back upright. Replaces manual stowing seat, and includes the value of that feature. Seat powers into a well completely beneath the floor level to enlarge cargo area. Also powers back upright. Replaces manual stowing seat, and includes the value of that feature. Removable center seat, second rowCenter seat does not stow in the floor like the others. Center seat does not stow in the floor like the others. Removable second row seatsSeat must be removed for maximum cargo capacity and a flat load floor. Seat must be removed for maximum cargo capacity and a flat load floor. Stowable second row seatsSeat stows in a well completely beneath the floor level. Seat stows in a well completely beneath the floor level. Stowable third row seatsSeat stows in a well completely beneath the floor level. 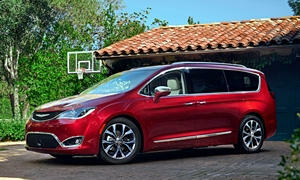 None of our members have yet commented on the available features of the 2018 Chrysler .